Our European operation is based in the UK and run by professional, dynamic photographers & videographers. 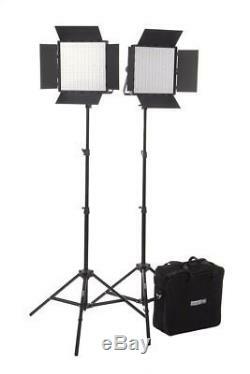 Our goal is to provide you with high quality photo & video lighting equipment and accessories. Our products are suitable for both professionals and hobbyists. We will resolve any problems direct from the UK that may arise in a quick and easy manner. We stand behind our products and service and will always do our very best to take care of you all needs. 2 x 600 Bi Colour LED Panels. 2 x U Bracket Mount & Wing Screws. 2 x 2.3m Stands. 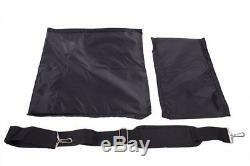 1 x Dual Carrying Case. 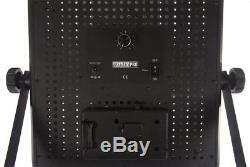 Fovitec 600 Bi-colour LED Lighting Kit. This kit is a perfect long-term investment and a great addition to change up your photography & video shoots! Our bi-colour LED panels are encased by a aluminium housing thats strong and robust. Packed with 600 long-lasting LED's which produce 3200k-5600k (Kelvin full spectrum) lighting with a CRI of 90+. Great for photography or video use. Its easy to control your light output with the dials at the back changing the daylight and colour temperatures as required. Variable Flicker Free Bi Colour 5600K/3200K. Composed of 300 Tungsten (3200K) LEDs & 300 Daylight (5600K) LEDs. Diffusion Filter Included: 2x Opaque diffuser, 2 x Orange Diffuser. LED Count: 600 at CRI > 90+ (Per Unit). Panel Dimensions: 38cm x 7cm x 40cm. Our Bi Colour studio lighting panels use powerful LED's that produce powerful bi colour 3200K - 5600k & 90+ CRI. Designed to enable you to take full control of your creativity; use the bi colour dials on the back to easily adjust the output of your lighting, allowing more light or less for the desired shot. The dials can help create low-key photos for dramatic shots with shadows or, high-key shots for product photography for ecommerce platforms. The options are endless with this LED portrait lighting panel! Perfect for portraits you can create depth between your subject and the background or, use attachable barn doors to focus your light on a specific area. It can be used for a mixture of high & low-key photography. With the adjustable lighting you can quickly take away, add highlights or add warmth to your image. Commercial Videos, Marketing, YouTube, Vlogging or Interviews. Used by professionals for videos, YouTube blogging, interviews, product videos, film & commercial use. The Fovitec StudioPRO bi colour LEDs let the videographer control & produce great video content with a continuous light source. It has a low power & heat output, unlike halogen or fluorescent lighting, the LED's do not overheat. This allows you to run your production for longer & use multiple LED panels through one power source. With a CRI (Colour Rendering Index) of 90+ our LED panels let you create accurate colour exposure on your subject. This is perfect for shooting colourful scenes & cutting down your editing time. It's robust and reasonably lightweight, packing down easily for travel. It comes with a V lock battery attachment at the back (battery not included), which is great if you're on location and don't have a power source. The StudioPRO Premium Bi-colour LED 600 Light Kit with Aluminium Casing is a 3200K-5600 Kelvin full spectrum tungsten or daylight balanced LED panel light that is great for photography or video. This lightweight unit is great for on location videography or photo shoots. The 600 LED light panel produces a longer illumination than normal compact fluorescent lights, because each LED bulb produces a 30-degree angle beam, directing the light further forward. Included is one soft light filters. The soft light filters are used to soften the light output. The aluminium casing allows weightless, yet strong protection for your lights. It is mounted on a U-shaped bracket, which makes it easy to position within 360 degrees. It can be used on any of our StudioPRO light stands. It features a dimmer located on the back of the head for complete lighting customization. This head generates virtually no heat, which makes it great for long photography, or video shoots. Best Photo/Video Uses: interviews, still photography, and product videos we use these lights for our videos! Adjustable Lighting: Dial-adjustable, blanced panels can be equipped with filters for diffusion/color temperature changes. For Video and Photography: Continuous flicker-free LEDs make the light ideal for portraits and vlogs. Safe and Energy-Efficient: Ultra-low heat output and energy usage. (2) x StudioPRO Premium Bi-Colour LED 600 Light Panel Aluminium Casing. Bi Colour 5600K/3200K variable dial. Composed of 300 Tungsten (3200K) LEDs and 300 Daylight (5600K) LEDs. Panel Dimensions: 39.4 x 40.6 x 3cm. 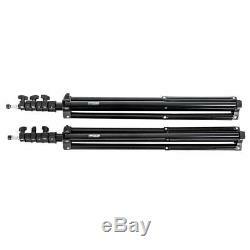 (2) x 7'6 Professional Quality Aluminium Adjustable Light Stand. Height: Adjustable from 70 cm to 2.3m. Base Tube Diameter: 3.8cm. 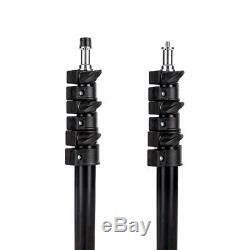 Slip Resistant Rubber Tipped Legs. Quick Release Levers for Smooth Height Adjustments. 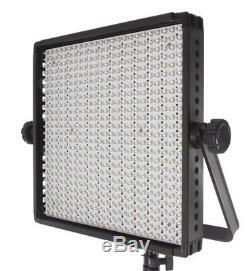 (2) x StudioPRO LED Barndoor Light Modifier for 600 LED. 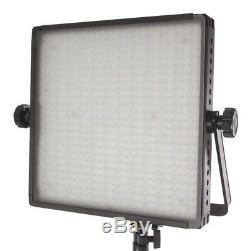 (SP11-006-600) StudioPRO Premium Daylight LED 600 Light Panel with Aluminum Casing. 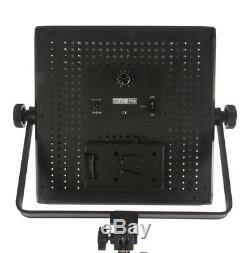 (SP11-007-600) StudioPRO Premium Bi Color LED 600 Light Panel with Aluminum Casing. Daylight or Bi Color LED Panel. 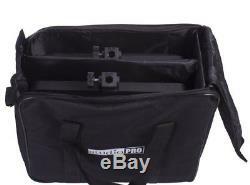 (1) x StudioPRO LED Carrying Case For Two Premium 600 LED Panels. For use with 600 LED Panels StudioPRO S-600D, S-600B, S-600DN, S-600BN, CN-600SA, CN-600SD, and CN-600CSD. Daylight or Bi Color 600 LED Panels. Measures: 39.4 x 40.6 x 7.6cm. The item "Fovitec 2x Bi-Colour 600 LED Studio Film Video Photography Lighting Panel Kit" is in sale since Monday, December 11, 2017. 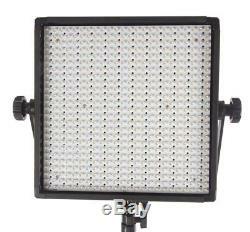 This item is in the category "Cameras & Photography\Lighting & Studio\Continuous Lighting\Lighting Units".